The Samsung SPC-6000 is a system controller which can control up to 255 individual PTZ domes, DVRs and matrix switchers. The Samsung SPC-6000 can be used in conjunction with up to 16 additional SPC-6000 units providing flexible expansion up to very large systems with userfriendly centralized control. The built-in 5” colour LCD touch panel provides an easy way to select camera locations and navigate control features such as video playback and preset positions, making it easy to manage a complete CCTV system. 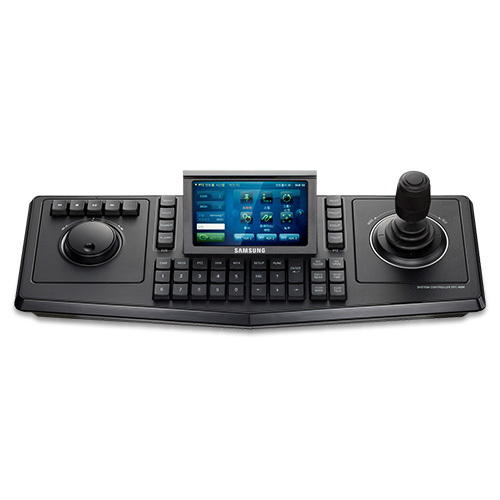 The SPC-6000 has a 3D joystick and jog shuttle can be detached and placed on either the left or the right hand side of the controller making it suitable for left and right handed operation and it’s ergonomic design makes it very comfortable for use over sustained periods. 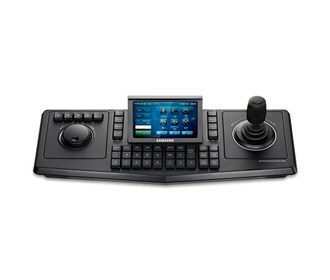 The Samsung SPC-6000 has many exciting features for users of all types. See the Samsung SPC-6000 gallery images above for more product views. The Samsung SPC-6000 is sold as a Brand New Unopened Item.